The Fellowship was fortunate enough to obtain a copy of MYTHIC #1 from Image Comics. Phil Hester writes, and John McCrea draws and colors. Got a problem? No, not a normal problem. A problem that’s completely inexplicable to modern science. Then call Mythic Lore Services. Today, Waterson and his team are working on a drought problem. Cassandra, the team’s prophet, believes that the mountain is angry with the stormcloud and keeps running it off. The solution is, shall we say, creative – assuming it works. The prologue (in which Nate meets Waterson) is a really fun way to start this story. In a few pages we learn a lot about Nate, Waterson and the world – which is mostly that everything we know is wrong. There’s a ton of world building here, but even the moment of exposition is done really well, made interesting by the way it’s delivered. And Mythic is a cool concept, and one that can go in pretty much any direction. The art is nicely done as well, especially the details in the close-ups and the dude on the last spread. Many of my favorite new books are the ones that are hard to classify. Even trying to classify this one would honestly spoil the story, so just go get it. 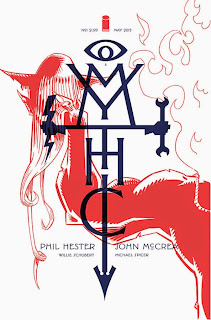 MYTHIC #1 is available now at your FLCS or at imagecomics.com.